Knitting and weaving are in Berta’s blood – as a young girl growing up in Bolivia’s mountainous countryside she used to watch with fascination as her mother made all manner of handicrafts using traditional indigenous techniques. Berta followed in her mother’s footsteps and soon began using llama wool to weave bags and the brightly coloured pieces of fabric that many indigenous women use to carry babies on their backs. But sales in the country’s rural southwest where she lived were few and far between. Desperate to make ends meet, her husband set off for Chile where he found work harvesting onions. While they had enough money to survive, living apart left them both unhappy so they packed their bags six years ago and moved to the up-and-coming city of Cochabamba in central Bolivia. And it is here that the story of Berta’s involvement with Tantakuna, a women’s artisanal cooperative in the community of Mineros San Juan, begins. Although her husband found a job as a taxi driver, his income was not sufficient to support them both so Berta began cooking and selling a dish of crispy fried chicken with rice at a roadside kiosk. But when her sons – now aged two and five – were born, life became even more exhausting than before. 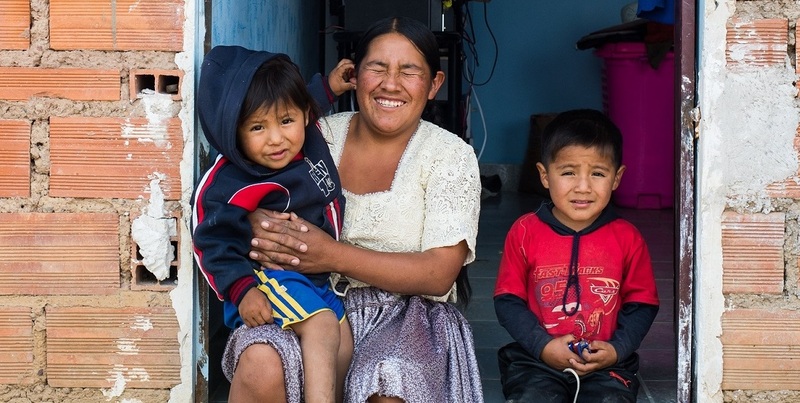 Like many women in Bolivia, Berta was expected to look after the children as well as going out to work and doing all of the washing, cooking and cleaning. And like many children in Bolivia, her oldest son only goes to school in the morning, making it difficult for her to work outside the home in the afternoon. Nonetheless, Berta needed to continue earning money for her family so she asked if she could join Tantakuna and, thankfully for her, the other women agreed. While she still has a long list of household chores to work through every day, she can now stay at home and keep an eye on her children while making belts, bracelets and pot stands. “My sons play in the house when I work in the afternoon – they’re in the same room as me so I can look after them and weave at the same time. That makes it very practical for me to work from home and I’m really happy with my job because if I have work I can earn some money,” she says. What’s more, working for Tantakuna means she can now afford to buy toys for her children. She says the job is also helping her to provide her children with a brighter future because she now has sufficient funds to kit her oldest son out with school uniform and cover his other school-related costs. She’ll be able to do the same for her younger son once he’s old enough too. At 25 years of age, Berta is one of the younger women in the group and is also proud to be called its president. One of her main responsibilities is to keep in touch with the local chamber of small industries to find out when and where fairs are taking place – and whether the women can run stalls at these events. She loves Fridays because that’s when she meets up with the other nine members of Tantakuna to discuss what products they should make, where to sell them and how to price them – as well as having a good giggle. “We have a lot of fun. Sometimes we get angry because we don’t always agree about everything to do with the products but it’s only for a short while and then we’re happy again,” she says. Berta spends up to eight hours a day making products for Tantakuna. It’s a labour of love – making a belt takes two days and brings in the equivalent of up to $17 while a bag takes a whole week and earns her about $29. She says the money is sufficient to live on if she has a good number of orders. At the moment she is busy making earrings, bracelets and small bags to sell at a fair in December. But for Berta being part of this women’s microenterprise is about so much more than simply weaving and making money. “We talk about all sorts of things – if I have problems with my husband, I can talk to other women in the group and we also discuss our children and how to educate them. The other women are like friends to me and the best thing about Tantakuna is sharing with them,” she says.